Truth is, I prefer not to eat late at night, and after a full day at work and an attempt at a work-out I prefer to have something quick to reheat. But I'm very particular about what I like to eat. I'm not down with TV dinners, and I rarely do takeout unless the BF is visiting. Monday night's dinner may not have been my prettiest, but damn it if it wasn't tasty and filling. Remember those chickens I made this weekend? Well, my leftovers have been coming in handy, and Monday's dinner was no exception. When I roasted the chickens, I also I baked a sweet potato. Hey, if I'm gonna turn the oven on, I might as well take full advantage! Monday after yoga and a shower, I put half of the sweet potato in a bowl, mashed it....added a little salt and pepper. Then I topped it with some shredded white meat, and a little barbeque sauce....a quick zap in the microwave. 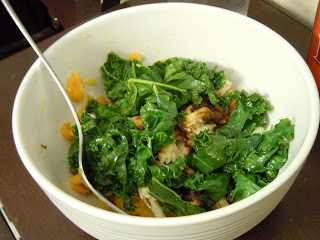 Then I quickly sauteed some kale and topped it off. It was delicious, filling, and relatively healthy. I had the same thing for lunch the next day....Hmm, I still have a ton of meat - how long until I get sick of chicken? What's your favorite quick dinner? I'm a huge fan of leftovers, or eggs! My favorite quick dinner is a stirfry. I always have loads of frozen veggies and proteins in the freezer for just this reason! I am a big fan of eggs too!